The previous article on this subject concentrated purely on the various bookmakers which offer live football streaming via their web sites. Now, I will focus on the other ways of watching your favourite games, which might not be available in your territory due to TV and satellite contractual restrictions. 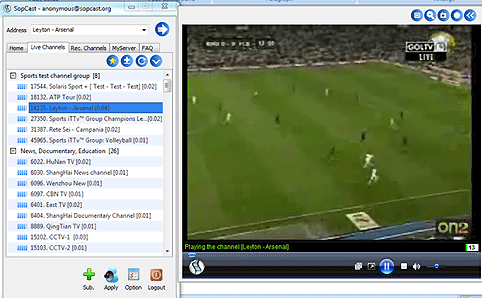 Firstly, there are P2P (peer-to-peer) players such as Sopcast and TVUPlayer. These are stand-alone, free downloadable software packages allowing access to hundreds of different TV channels, including sports. In its simplest form, P2P is a file share and content distribution mechanism popularized by sites such as Napster and is used today by companies such as Skype. According to Wikipedia, since 2004 P2P is the largest contributor of network traffic on the internet. Personally speaking, TVUPlayer is my favourite as it offers more channels to find what you are looking for, combined with ease of use. Sopcast seems to have longer buffering times, fewer channels and more interruptions to the picture. However, both packages are essential to cover the gaps of each other. Scroll down to “How to use Sopcast” and click on the link in section 1 to download a Zip file. Once you have done this, “extract” the Zip file in the normal way (by right-clicking on the file when the Zip box appears) and save the program wherever you choose. You can then open the program and begin using it to view various channels from around the world, although you may have to bear with the language of the broadcast. If it’s just football that you want, then I am sure the picture is more important.